Away day experiences – sitting in the home end!!! I was anointed an Everton fan despite being born and brought up in London. So when watching Everton away, I was actually only doing what my Dad had done for years, as a Blackburn supporter, watching us every time we came to London. Unlike me, my Dad never got to go to his ‘home ground’, dying after supporting his team from afar for over 80 years. By today, the only London ground I’ve never been to is Brentford (don’t know why), apart from numerous non League grounds of course. My memory is of always travelling with a rickety wooden box my dad made for me to stand on, wobbling about on the terraces, with an anxious Father wondering what would become of his creation (the box, not me) if my celebrations ever got too exuberant. The box was essential from the age of about 8 until 16, and in those early days it was vital, otherwise I would never have seen the likes of Labone, Hurst, West, Ball, Kendall, Harvey, Royle, Wright, Wilson, Whittle, Husband, Morrisey, and so many more. No such thing as standing at an away end that I can remember, Dad usually getting a ticket from the London team’s box office, so he was always doubly worried how loud I’d shout in case he was the one that copped for it! Much to concern him then, a box reduced to firewood, or weaponry for opposing fans, a bonk on the head for himself, and a cheery kid slapped by his olders but certainly not betters. I don’t remember this being a golden age of watching football as an away fan – even then, wearing your colours wasn’t advised, and on one memorable occasion we went to see Blackburn at Chelsea, sat in very expensive seats in the main stand behind the Directors, and my Dad being spat on when he stood to cheer an unlikely Blackburn goal. Everton at QPR was one game that stood out for me. It was when QPR had their artificial pitch, and we were right by one touch-line, so close to the players – I’m not sure players are much further away today – which was exciting most of the time, but a bit scary when Psycho Pat [Van den Hauwe] got in to a full-blown fist fight with Simon Stainrod in a game there in the early 80s. It is amazing what incidents like that do to a crowd, and we see that even now, it becomes almost gladiatorial with the crowd baying for blood, not always just the ref’s! I came to Nottingham to work in 1979 and have been here ever since. So for me, almost every game is an away game. No walking to the ground for me, but a 2 hour minimum drive up to GP, or the occasional trip to a ground a bit closer, ticket permitting. It used to be easy to get an away ticket, but not now – they are always sold out long before they get to an Evertonia member like me – and so I’m often reduced to watching from the not very warm embrace of the opposition fans. I am now a world expert at moderating my enthusiasm to protect my life. 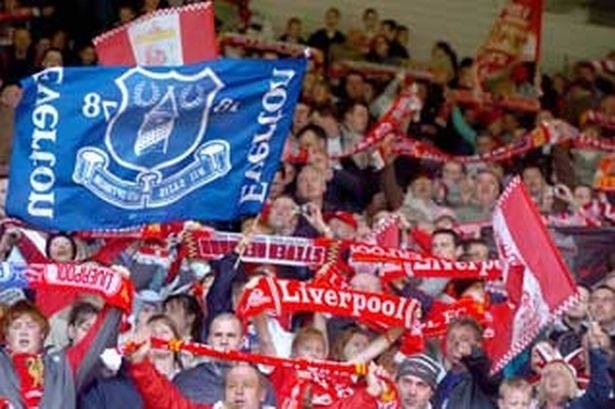 We are looking to start a new section on the site relieving the experience of travelling to an away match with Everton. We would like to publish the thoughts and experiences of as many Blues as possible, whether it be a trip across Stanley Park to watch the Anfield derby, or to Kharkiv in Ukraine for a UEFA Cup match. If you have a story to tell and want to pass on your experiences please get in touch using the ‘contact us’ link on the left menu bar.